Last night was part three of my Sparkle Dress Comedy Challenge and a trip to Sheffield’s City Hall for ‘Lefty Scum’. I worked all day in Meadowhall, got changed into the sequins in the staff room behind some mannequins (getting semi stuck in the previous dress as I went) and headed to the tram stop, hoping to get to the venue on time. I found my seat, but had to take the long way around to get to it and missed out on a trip to the bar – but then the queue was long and I have very little money left at the end of the month, so never mind. The gig was kicked off by Josie in some great dungarees doing her bit of ‘chatting’. I’ve never seen her live before, I’ve heard some of her podcasts: Short Cuts, Robin and Josie’s Utter Shambles, Book Shambles and as a guest on others like The Made of Human Podcast with Sofie Hagan. Na na na nanana naaaaa, nana na na, hey Jude! 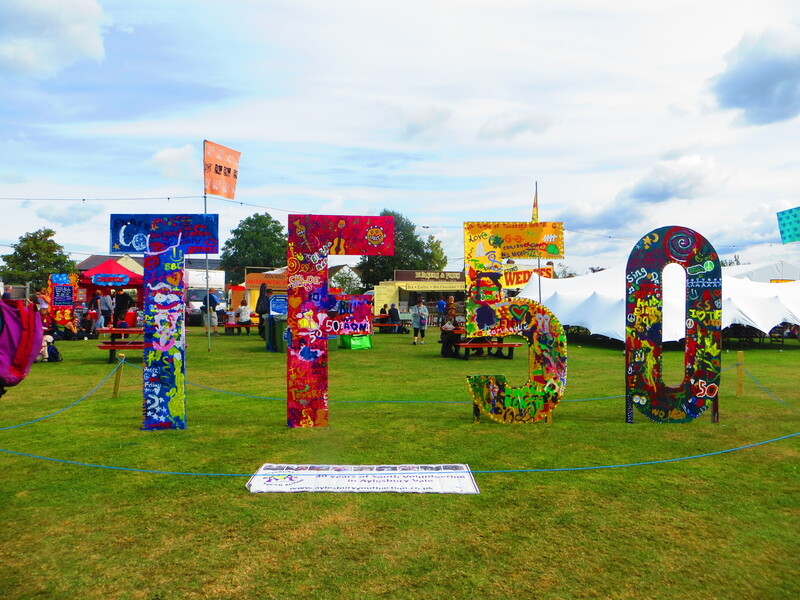 Fourteen years ago I picked up my GCSE results, walked back down the hill from the top site hall to my house, picked up my bag, piled into a car and was driven, by Mum, to Towersey Village Festival. I didn’t know that I would be attending 12 of the following 14 years’ festivals, nor that I would remain camping with the same kind people who feed me and give me a chair to sit in and a gazebo to be sheltered by. I didn’t know that people from that festival would inspire me to study their music at university or trust me to be involved in the behind the scenes workings. I’ve bought a pair of Dr. Dre Beats because I thought it best not to have in-ear headphones whilst battling a possible ear infection. They’ve been amazing. After about 4 days of not listening to things I was suddenly filled with a world of my choosing, able to block out the bustle and clamour of Khao San Road, bus and train journeys. I was torn between two songs this week as the main post. There could have been many more contenders and there’s an amazing one from Nina Simone that will eventually be featured, but didn’t fit with what I’ve been been up to. Come to think of it, the actual song of the week doesn’t either, but I’ll get to that in a second. The runner up is an oldie. Let’s set the scene a little. You find that your hostel can’t book you in for Friday or Saturday night, so you manage to arrange somewhere else for Friday and then decide to head off on some trips. Saturday night you will be sleeping on a floating house on the River Kwae (Kwai) as part of a two day excursion, so what to do on Friday? I know, visit some temples. So I did and was trundled into a bus with a group of strangers for a fair few hours. I got chatting away with Sharron from the moment the bus door closed, she’s Scottish, a make up artist and doing a little trip of Thailand. But the rest of our excursion we’d not really chatted to. But that’s fine, everyone is doing their own thing, looking around, taking the pictures of monuments and thumbs up in front of a giant Buddha. But at lunch time we were all sat around the same table having almost warm rice, sweet and sour chicken, stir fry cabbage and omlette. A song was playing. The American to my right said it was Celine Dion. He was correct. So I, of course, started a game, how quickly can you name the next song? This people guessing, however there was a mis-translation at some point as we then started predicting the next song. I said I’d really like some Spice Girls. One of the others suggested ‘2 become 1’. All agreed it would be a classic. Three tracks later – 2 become 1 came on. We all thought we were magical. So that’s the runner up. The main track, however, is a song that I first heard on the plane from Mumbai to Bangkok and I’m going to have to learn it. It’s haunting, it’s beautiful, it’s tender and sad. I love it. I don’t know how you couldn’t really. A song written whilst waiting for the train back from the excellent Warwick Folk Festival in July. I’ve packed a few notebooks to take away with me and managed to find this in one of them. You have to imagine a vaguely bluesy tune to go along with it. Babe, babe whatcha doin’ babe? Don’t throw my things all over the floor! And I’m sleeping in the tent next door. To the khaki tent they’re sharing next door. Babe, babe, whatcha doin’ babe? Don’t throw my stuff all over the floor! Are loudly screeching from the tent next door. Coming from the khaki tent next door. And he whispers that she’s talking too loud. As I’m creeping past the tent next door. There are cheers from other tents all around. Just trying to sleep here in the tents down the line. Beverley East Riding Festival ages ago. 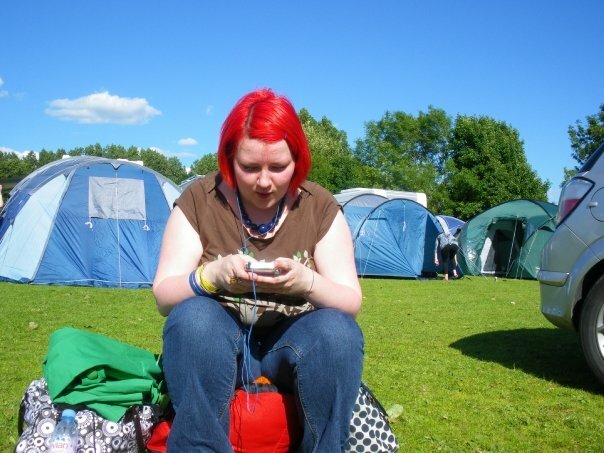 I have no pictures of me at Warwick, but at least this one is at a festival and includes tents. I’m now going to try and link to a song I’ve been been listening to each Saturday. It probably won’t last but you never know. So I’m trying to pack, make sure I’ve cancelled all I need to, washed clothes, sorted medications, found passport, re-checked passport, but I’m also trying to put together a set list for a school friend’s wedding, so I’ve been searching through my singable collection to see what happy love songs I’ve got. Ingrid Michaelson is one of my new favourite singers. This song is beautiful. Have a listen. I think you might like it. The Second Line Song Game: Part Deux. The last one was pretty successful, I think we got most of the songs and those that we didn’t, well I can’t remember what they were anyway. My itunes was re-written for a new computer and ipod, so we may never know. But for your entertainment, here’s another 25 second lines of songs for you to guess. I’m looking for the first line, the artist and the song and I’ll put your name next to it if you get it right. Oh, the fame! Just like me love everlasting. Ok, so I should admit that I’ve just googled myself. It’s not big, it’s not clever, it’s not something I’m proud of but I’d just seen a facebook post from my cousin Iona who had cut her own fringe and it reminded me of something I’d once written about cutting my own hair with kitchen scissors. I can remember doing it, sat in my bedroom, 39 Curtis Road, Newcastle, with its rag rolled golden walls with one brown striped wallpapered room before one wall of wallpaper was cool. I’d propped the mirror up on my desk and started cutting in some layers and hoping for the best. I did a similar thing about 2 weeks ago – my graduated bob grew out about 3 months ago and the African sun combined with bleach and repeated coverings of red hair dye had left the ends frazzled. I had wanted a professional hairdresser to fix it but couldn’t get hold of her so one Saturday afternoon, whilst avoiding doing some actual work I switched on the bathroom light, took the kitchen scissors in my hand and started to hack away. The result wasn’t that bad.